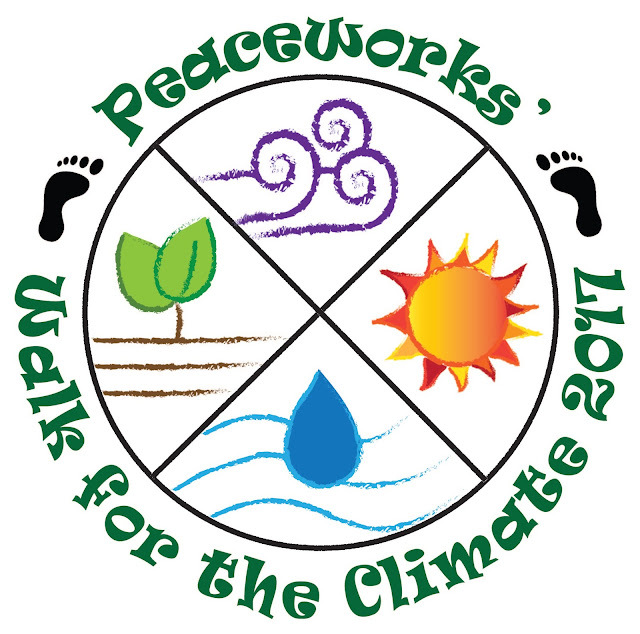 Peaceworks: Get Ready to Walk for the Climate! Get Ready to Walk for the Climate! This lovely Walk logo will appear on our 2017 Walk T-shirts. Get yours by raising, or contributing $50 or more. Peaceworks invites you to rally and walk with us on Sunday, Sept. 24. Walk for the Climate is both a community awareness-raiser and a fundraiser. We will be walking five kilometers (approximately three miles) and urge you to walk the whole distance or whatever portion works for you. We also encourage you to walk with us whether or not you raise funds. This said, our goal this year is to have at least 100 people raise at least $50 each to reach our goal of raising an additional $5K needed for Peaceworks’ climate action efforts. So, if you can help raise some of these funds it would be super. All are invited to participate. Invite friends to walk. You can sponsor yourself. You can ask friends and family to sponsor you. There will be prizes for those who raise the most money and those who get the most donations. All contributions are tax-deductible. Checks should be made to Peaceworks. You can access a sponsor sheet by clicking HERE. Or you can pick one up at the Peace Nook. All participants who come to the walk on Sept. 24 with at least $50 in contributions will receive a free “Walk for the Climate” T-shirt (see design above). The shirts will be printed ASAP after the walk, when we know how many we need, and in what sizes. We will gather at Courthouse Plaza (8th & Walnut) for sign-in between 1:00-1:45. Excellent music during the gathering time provided by Pippa and the Straw Men. We rally at 1:45. The Walk begins at 2 p.m. Event is rain or shine. Bring raingear if needed. In the event of rain, sign-in will be in the Commission Chambers of the Boone Government Ctr. We’ll have some signs and banners, but more are welcome. Walk 5K. Help us raise $5K!